Problems With Your Gate Intercom? Call Us At Gate Repair Altadena! Your property’s gate allows you to control who can access your property. 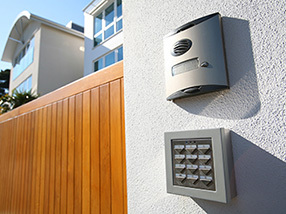 Your intercom system is essential for reliably identifying visitors, and checking whether they’re an unwanted intruder or an expected visitor. Without a phone entry system that works reliably, the security of your property can be compromised. Anything that stops you from controlling access is a major problem, which is why our team offers high-quality repair solutions for all types of intercom-related problems. There are plenty of ways that a complex system like this can go wrong. Wiring and circuitry problems can prevent the audio systems from working correctly, or prevent you from reliably opening the gate remotely. Physical damage to the unit's casing or internal components can also prevent it from functioning. Our technicians have more than ten years of experience handling all of these issues, and can deliver a fast and effective solution no matter what the problem is. Gate intercom repair is one of our specialties, and there's no issue involving these systems that our technicians can't solve. Modern phone entry systems offer many advantages, often coming with video technology and smartphone connectivity. This can provide additional convenience and security, making a new intercom system a great upgrade for your gate. Our team will guide you through the many different models available today and provide all the information you need to make an informed decision. Our technicians will then complete the installation to the highest standards, guaranteeing its reliable operation from the first day. It’s essential that your property has a reliable phone entry system. If you need a fast solution, or are looking to install a more modern model, get in touch with our team at Gate Repair Altadena today. Our experts are always ready to help.